I’ve been repeating the same message over and over the past few weeks – On a Monday-Sunday time frame, the Phillies hadn’t won more than 2 games since the end of April. With every passing week, it was getting more ridiculous just how consistently bad the team was. That streak has come to an end – the Phillies played 6 games from June 26th to July 2nd and won 3 of them. The wins were by a large margin – they outscored their opponents 20-7 in their victories (on the flip side, two of the three losses were by 1 run). It’s too early to break out the party streamers – besides the obvious fact of their season long record (still last in the majors), their future has taken a small hit – with Howie Kendrick on the DL, his trade value is undeniably lower today than it was yesterday. Is it something to get worried about? No. Is it a bigger deal than a 3-win week during a forgettable season? Yes. Let’s all hope for a full and speedy recovery for Kendrick. Game 75: Loss, 1-6. Nick Pivetta took the loss, walking 5 batters (which ties the season high for a Phillies starter). 5 walks is a lot, but not unheard of – in the past 5 seasons, the starter has walked 5 or more batters 26 times. The “Wildest Phillies Pitcher” crown either goes to A.J. Burnett or Phillipe Aumont. A Phillies starter has only walked 6 batters or more 7 times – A.J. Burnett has four of these. However, Aumont holds the undesirable distinction of being the only Phillies starter to walk 7 batters in a single start over the past 5 years. It was Aumont’s only start in his professional career, and it ended up being his final major league appearance. For those wondering – the most walks ever in a start by a Phillies pitcher is 12, by both Curt Simmons in 1948 and Jimmy Ring in 1924. Jimmy Ring ended up pitching the entire game. As much as we wring our hands and fret over baseball changing, can you imagine how miserable a complete game, 12 walk performance would be nowadays? Game 76: Win, 8-2. To the Mariners credit, they only allowed 4 earned runs. To the Mariners discredit, they allowed 4 unearned runs. Aaron Nola was dealing, going 7 innings and matching his career high with 9 punch outs. Howie Kendrick was the DH for the game as he had hamstring tightness, but was put on the DL after the game. As I said in the intro – Kendrick’s health is the linchpin to his trade value. Short stay plz. Game 78: Loss, 1-2. Phillies prospect Nick Williams made his major league debut and notched his first hit to boot. The offense wasn’t able to muster much else – the 1 through 5 hitters didn’t reach base once as DeGrom punched out 12 of the punchless Phillies. Game 79: Loss, 6-7. With this game, the Phillies reached an 11-5 record in games in which they score at least 6 runs. 11-5 sounds like a good record – a 0.688 winning percentage over a full season would be a 111 win team…but losing less than 70% of your games when you’ve scored 6 runs underscores how poor the pitching has been. The league on average has won 85% of the time with ≥6 RS (trust me, we are going to need that shorthand). To give the Phillies credit, they won their next 2 games with ≥6 RS, improving their winning percentage in ≥6 RS games to 0.722… which is only good for 29th in the league. Here’s the league stats, sorted by winning percentage with ≥6 RS. Hooray! Not last place! If you look at it by winning percentage, which I think is a little disingenuous – the Giants had ≥6 RS in 24 games, a feat that the Phillies accomplished only 18 times this season. That 18 times is the lowest mark in baseball (The highest? Houston with 45. Hachi machi). 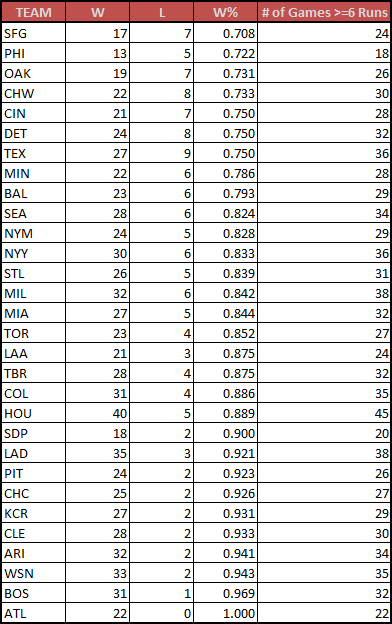 Combine the fewest ≥6 RS games with the second worst record in ≥6 RS games and you get a major league worst 13 wins with ≥6 RS. Last place again. It’s getting kind of comfortable, saying that. Game 80: Win, 7-1. Anytime we can avoid being swept, I’m happy. If it’s avoiding being swept by the Mets, doubly so. The Phillies did it with aplomb. 6 out of 9 starters reached base multiple times (nice). Aside from Franco’s double, the Phillies singled the Mets to death. Extra base hits are nice, but avoiding outs is better. Game 81: Win, 4-0. While we tend to think of the All Star break as the “halfway point”, there are more games played before the break than after. The Phillies closed out the “official” first half of the season with a win. Aaron Nola went at least 7 innings for the 3rd straight game, striking out 8 and walking 1. He took a no-no into the 5th inning before I turned on the TV and ruined everything. Sorry guys – I’ll take the blame for this one. At least the Phillies still got the shut out victory, right? Game 82: Loss, 0-3. On America’s birthday (wow, 2,017 years old already), the fireworks were entirely absent inside Citizens Bank Park – despite 11 times on base, the Phillies put up 0 runs. There have been 212 games in 2017 where a team has reached base 11 times. On average, that team has scored 3.7 runs. Only 6 times out of the 212 games (2.8%) has a team been held scoreless. The Phillies are doing some rare things, if you look closely enough. Game 83: Loss, 2-5. Every time I look closely at Franco, it seems like maybe he’s turning it around. Since June 23, Franco has 5 home runs (9th in baseball out of 238 players). He’s also striking out only 10.4% of the time. That’s about all that’s going well for him – his BABIP is 0.135, dragging his wRC+ down to 73. He’s not getting robbed on many hits – his xBA on the outs made is only 0.122, only two of the outs made since June 23 had an xBA more than .500. Overall, his xBA (.190) “agrees” with his BA (0.188). Power can mask problems, and while it’s too early to say it, right now Franco looks like Howard 2.0, minus all of the years of 45+ home runs. Game 84: Loss, 3-6. A Joaquin Benoit meltdown sealed the victory for the Pirates, which is a shame because it featured the strangest play to score a run I’ve seen in a while. The ingredients for this tasty recipe: A flying bat, an outfield shift, an unusually aware catcher, and a distracted first baseman. Game 85: Loss, 3-4. If the Phillies were going to build momentum going into the All Star break, they couldn’t have asked for a better opponent – the San Diego Padres, 29th in baseball in winning percentage. The script would not play out the way the team would like, as they ended up adding to their major league leading “one-run loss” total. After this game (and the next), they lead all of baseball with 23 one-run losses. No other team has even 20. It might be hard to be positive, but remember that one-run losses can just as easily go the other way. Nick Pivetta had 9 strikeouts, the beginning of a 3 game streak for Phillies starters with 8 or more K’s. Game 86: Loss, 1-2. The Phillies lost once again to the Padres, but the game featured a pair of encouraging performances – a home run from the more-cold-than-hot-lately Maikel Franco and an 8 inning, 9 K outing from Aaron Nola. These two have been considered building blocks for the Phillies, and more games like this will help to assuage any fears regarding their futures. Game 87: Win, 7-1. The Phillies followed up a pair of one-run losses with a one-sided victory. The half dozen homers were the most the Phillies have hit in a game since 2004. Jerad Eickhoff’s return from the DL was brilliant, striking out 8, walking 1, and allowing no runs. Between his sharp return and the recent Nola excellence, it’s easy to remember why there was some muted optimism surrounding the team during the off season. If only the arms could stay healthy. Japanese baseball rules. Anti-bat flippers, look away lest you risk an aneurysm. It happened, folks. Now we can end the season long charade, we got what we wanted – an unsuspecting Aaron Judge and Jose Altuve in a picture together. Before I end this post, I wanted to apologize for its tardiness. I won’t make any excuses, and I’ll do my best to stay on track from here on out. If the Phillies are going to be a trainwreck, you’re going to want to hear the play-by-play, and I will continue bringing that to you.